If you want to nourish your body, load up on these PFVs! 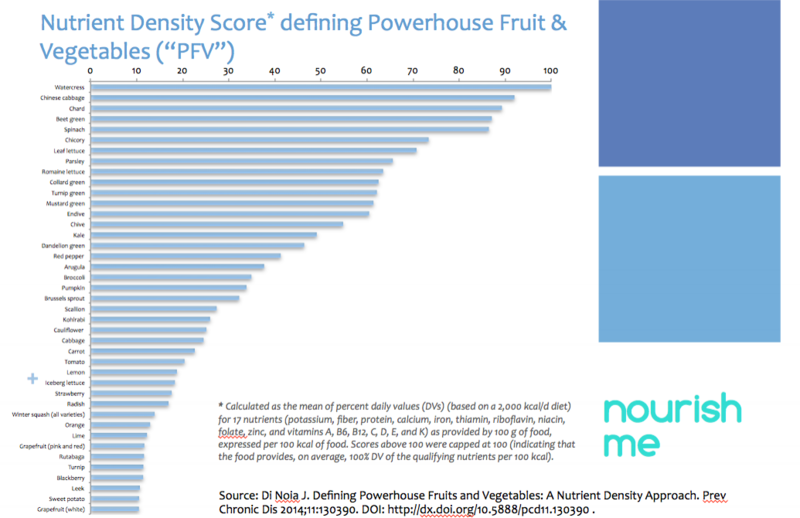 A study ranking 41 powerhouse fruit and vegetables by way of their nutrient density. Some scored high/low as expected, some may surprise you. The scientists have been measuring nutrient density by looking into 17 different key nutrients as provided per 100 g of food expressed per 100 kcal of food. Mind you, the study focused on certain food categories only (i.e. fruit & veg) and as such other nutrient dense foods may be overlooked. Nutrient content is measured in raw form. We like this research, as it measures the nutrient density of foods in terms of the energy they provide and as a result can help to focus on daily energy needs and getting the most nutrients from your foods. The rankings provide clarity on the nutrient quality of the different foods and may aid in the selection of more nutrient-dense items within the powerhouse group.